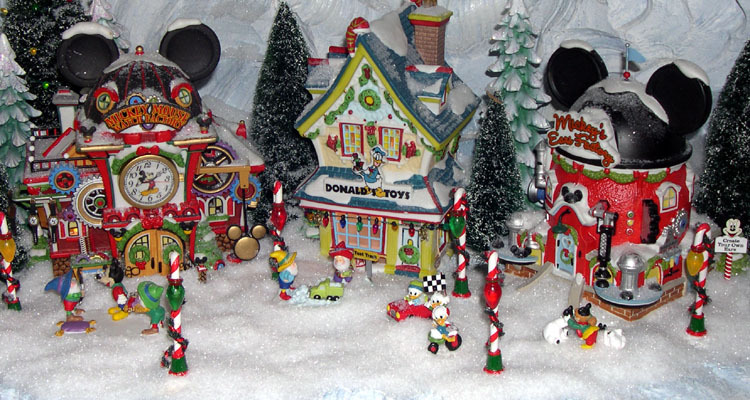 This trip will be less about the rides and attractions and more about testing our new Disney Vacation Club ownership, relaxing, exploring lesser known areas of Walt Disney World and getting into the Christmas spirit early. After a short nights sleep we were up at 4 AM to get ready for our flight. Our brother-in-law Rich pick us up and with no traffic made it to JFK Airport in only 25 minutes. The check in and security lines were short. 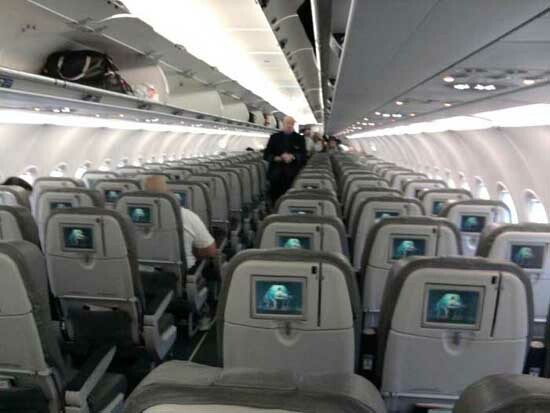 We needed to get seat assignments since the plane was full; we got aisle 25, seats E and F - the very last row of the plane. Jet Blue had changed the flight’s time from 7:05 to 7:30 AM. I’d wished they let us know, another 30 minutes of sleep would have been great! We boarded a little late as the airline was waiting for 80 students whose bus broke down. They were on their way to some sort of band competition in Orlando. After a few more minutes they knew the 80 would not make the plane and we taxied to take off on a very empty plane. The flight down was a little bumpy and landed an hour later then we had planned. We knew we would miss our 12 noon Advance Dining Reservation (ADR) at the Rose and Crown. 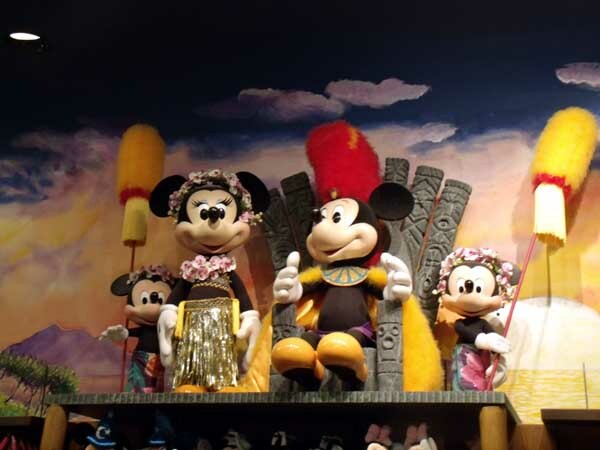 I stopped in the airport’s Disney store and made a vinylmation trade (collectable Mickey figurines), then headed to Disney Magical Express (DME). We had our DME booklet in hand so we got to go straight to the bus line. 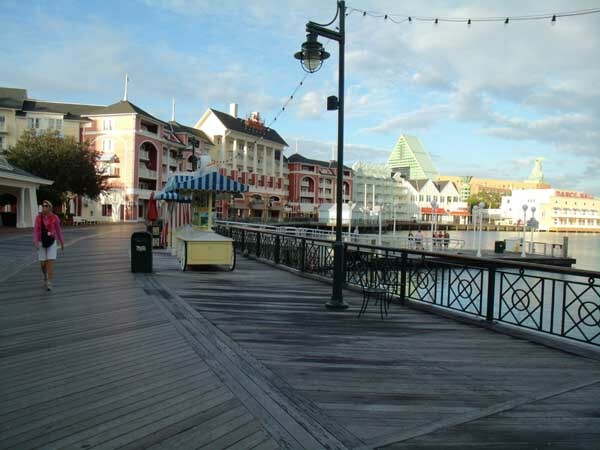 After some waiting in line, our bus took us to Port Orleans’s Riverside, the Caribbean Beach Resort, the Board Walk, then finally on to the Beach Club. I like the way the bus announcement says to “gather up your characters”. The bus was heading to Saratoga Springs Resort after our stop. Time from landing to the resort was 1 hr and 41 minutes. (10 minutes to taxi, 13 m to deplane, 15 m to get to DME with a stop in the store and restrooms, 13 m to wait for a bus, 9 m before it left and 41m bus ride). Longer than expected, but if we didn’t stop in the Disney store we’ve might have caught an earlier bus. Total DME time was only 1hr 3 minutes so I was pleased with the service - and its free!. I hope this info helps others trying DME. Tracie checked us in and was friendly and informative. Best of all our room was ready! 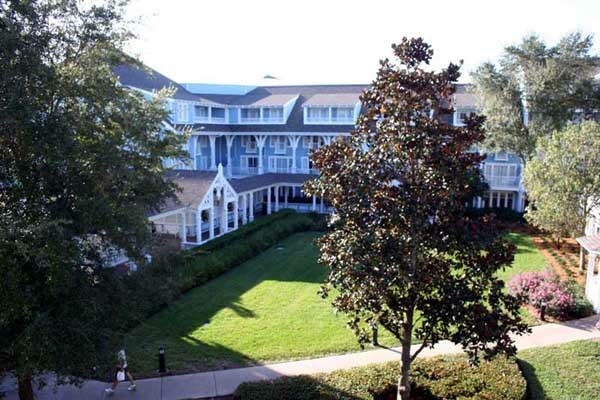 The Beach Club Villas are in a different building but surprisingly not far away, a short walk across a court yard. We dropped off our carry-ons in our room and walked the outside path to the international gate at EPCOT. We purchased our annual passes and the Tables in Wonderland Card. It gives us 20% savings in most restaurants. The savings will come when we are back here in less than a year. The park crowd was very light and we were able to wait for a table at the Rose & Crown. We shopped in United Kingdom while waiting for the buzzer to go off; it was a short wait, about twenty minutes. They sat us outside by the water. The weather was perfect, in the 70’s and sunny; we could not believe we were here. Nicole from Ireland was our server. We ordered appetizers and Bubble and Squeak – we just had to try it! 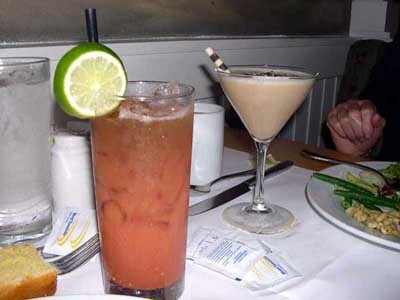 The appetizers were a cup of a delicious Potato and Leek Soup; Mary and the Lads - roasted shrimp cocktail with a spicy Bloody Mary mix; and the Scotch Egg - golden-fried hard-boiled egg wrapped in sausage meat with mustard sauce. 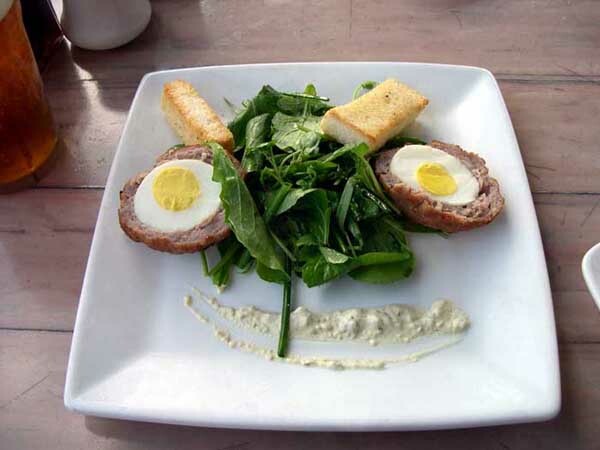 The small salad that came with the egg was delicious as well. Kelli had coffee and I had a creamy and refreshing Boddingtons English Pub Ale. With the Table in Wonderlands Card the bill was 43.70 $ with 18% tip, we left $45. Savings with the card was $8.47. 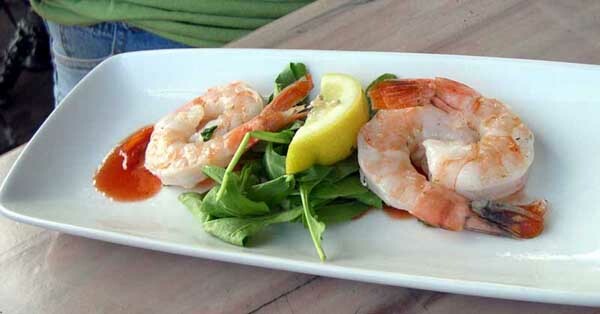 Just appetizers for lunch is the way to go! 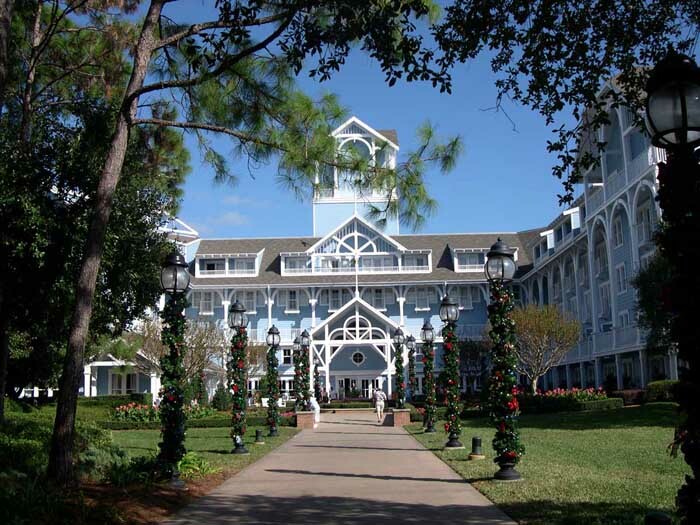 We headed back to the Beach Club, eager to explore the resort. We passed Alice from Alice in Wonderland heading toward the United Kingdom pavilion on the way out. Wow, we had a one bedroom villa on the third floor for just the two of us. Towels in shape of Mickey greeted us on the bed. The balcony overlooked the courtyard heading to the main building, great for people watching. Having all this room, full kitchen with stove, refrigerator and microwave, whirlpool, two TV’s, washer and drier, king-size bed, two sinks - we knew we would love our stay here. We took a walk around the resort. There is a quiet pool at the villas, just outside the lobby. For Stormalong Bay, the main pool, you walk across the courtyard then through the lobby, and around the outside of the Cape May Café then out the doors to the pool - sounds far but not really. We will try the pool later. We walked past Beaches & Cream ice-cream shop and the Periwig's Salon. Kelli checked their prices for a pedi and a manicure, expensive, but we are on vacation. She will make an appointment later, plus as DVC members we get 15% off. We went into the Yacht Club. Their lobby already had their miniature Christmas train set up. You can spend a lot of time looking at all the wonderful details. 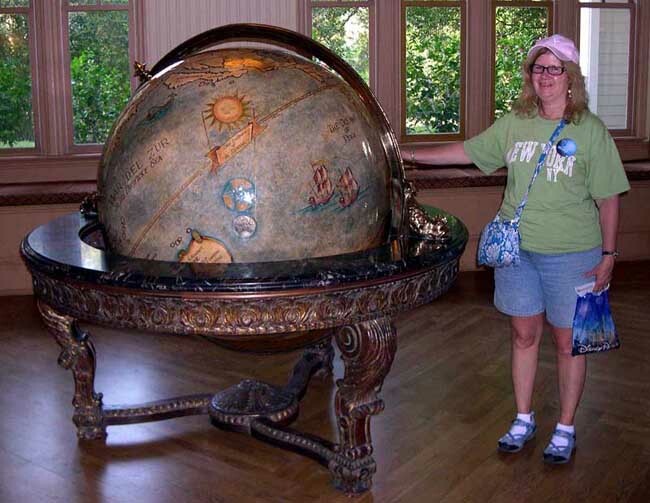 We checked out their gift shop called Fittings & Fairings; Clothes & Notions (look for the giant globe in the long hallway down from the lobby.) This is a good store to know about, it was large and had some Disney items that we saw nowhere else. I did some pin and vinylmation trading. Then we headed back with a stop at the Beach Club Marketplace for eggs, bacon, English muffins, milk and cereal. 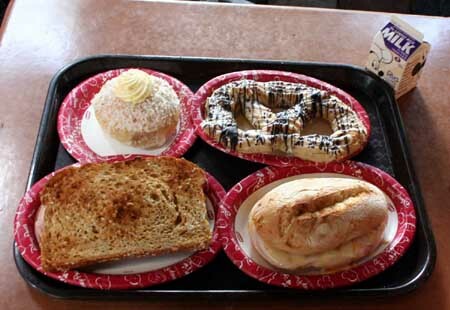 We will make our own breakfast – a new thing for our Disney vacations. We took a nap – the early wake up time was hitting us. Afterwards we relaxed on the balcony, enjoying Florida’s warm and fresh air. We then freshened up for dinner. A true test of a man’s strength is how long it takes to open one of Disney’s soaps wrapped in its indestructible clear plastic. We headed downstairs for dinner at the Cape May Café. This is a seafood buffet. Tonight's special was calimari. We’ve eaten here before and we were again pleased with the food. The calamari and fish were perfectly cooked - too many restaurants overcook them. The ribs also hit the spot. For drinks I tried a Captain's Rum Runner- Captain Morgan original spiced rum, blackberry brandy, créme de Banana, and tropical juices topped with a float of Myers's original dark rum. Kelli ordered a Godiva martini. Kelli liked that they have paper “tablecloths” and crayons – you can doodle in-between bites (along with a few love notes to each other). With the Table in Wonderlands Card the bill was $92.86 with 18% tip. Savings with the card was an even $18.00. 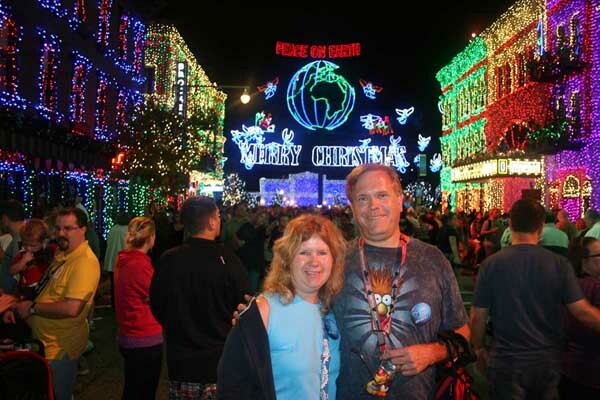 We decided to head to Epcot, walk around the world and see IllumiNations. We stopped in Japan to shop the department store. When we came out we knew we were down wind. It will get smoky here during the fireworks/laser show. 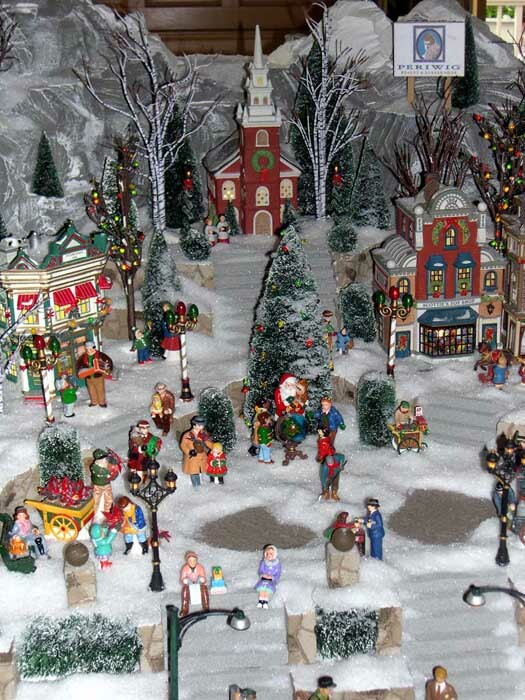 We continued on and we noticed that the “Holidays Around the World” display was set up in Germany. It talked about how the Christmas tree tradition was started by Martin Luther. though the branches were covered in glistening snow. We found a spot on the bridge next to Mexico and the World Showcase Plaza. The small rise in the bridge made for some great viewing. We enjoyed Illuminations then walked back to our room. This last sentence is fabulous; “we walked back to our room” - no long walk through crowds to the buses, no long wait for a bus, and no standing all the way back. We were in the room within minutes, but we were still tired. The whirlpool bathtub called our name and it felt great to relax and take care of the aches and pains of a long day before going to bed. We had planned to sleep in this morning - an unusual thing for us to do at Disney but it was the right call. We wanted to relax and enjoy our accommodations, plus we had the Christmas party tonight. We woke up when we woke up without an alarm clock. Kelli needed jelly for her English muffin so I threw on some clothes and went to grab a couple of packets at the Marketplace. A surprise awaited me exiting the elevators. 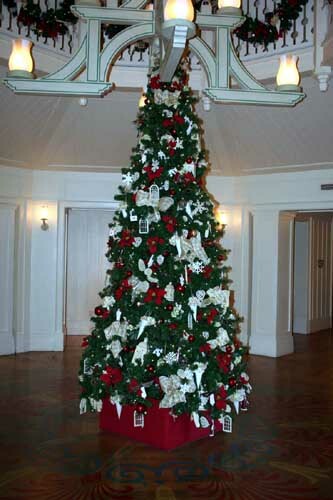 A little Disney magic made a 16 foot Christmas tree appear overnight in the building’s lobby. 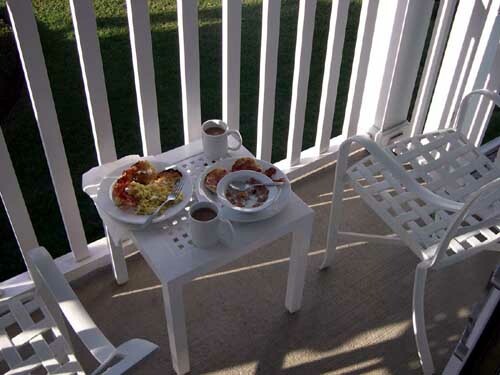 I quickly returned, made breakfast and we enjoyed it out on the balcony. Kelli called Periwig's Salon for a mani and pedicure and they had an appointment available in 20 minutes. We quickly got ready and I walked her down. They had started to build the gingerbread carousel in the Beach Club lobby. 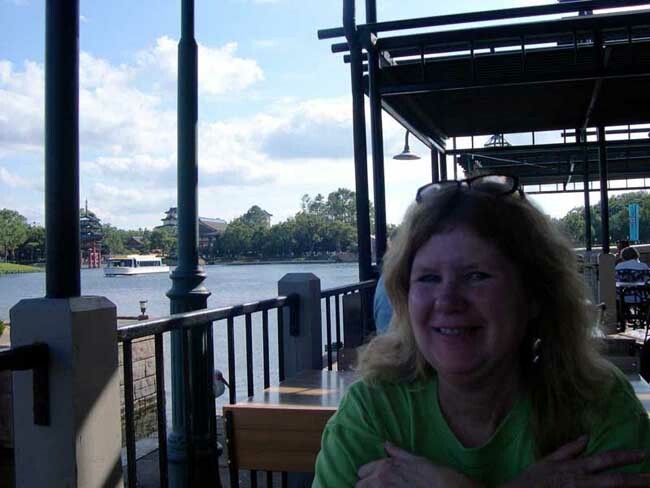 I dropped her off, and went off to explore the Epcot resort area and walk around the lake. We’ll meet up at Stormalong Bay pool later. More Christmas decorations had gone up. 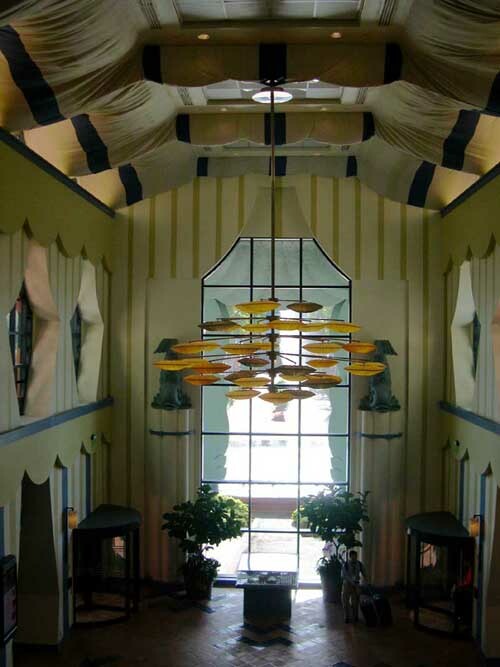 The light poles at both the Beach and Yacht Clubs were adorned with garland, making for very festive entrances. 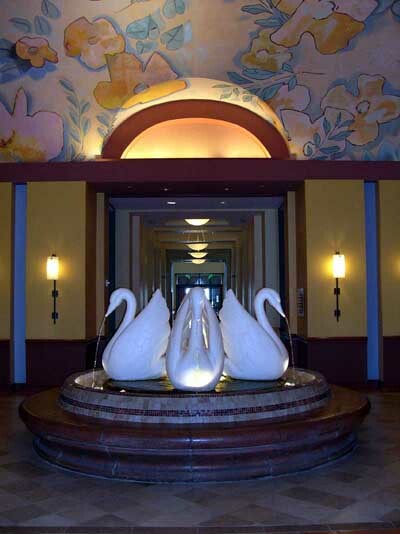 I walked around the lake taking pictures stopping at both the Swan and Dolphin to view their lobby’s and check out their gift shops. I brought Kelli a little gift for the day, a vinylmation jr key chain in the “It’s a Small World” series. Next stop was the Boardwalk, making vinylmation trades where I could. I arrived back at the Beach Club and headed into Stormalong Bay. I found a lounge chair close to Periwig's so Kelli could easily find me later and I hit the pools and water slide. I had read about complaints about feeling each joint in the water slide on the ride down. The first few rides on the slide were smooth and great. For my next ride, instead of laying flat I sat up a bit to slow down and take in more of the ride, that’s when I felt the bumps all the way down. If you sit your rear end will stick out and hit each one. Next was the deep, but short, so called lazy river. I slowly swam it but I don’t think there is much a current. I also enjoyed the pool and waterfalls that has the soft sandy bottom. I texted Kelli my location then relaxed and got some sun. Kelli easily found me and we both enjoyed the sun for a while. A great thing about staying at the Beach Club – you can easily walk over to Epcot just for lunch, and that’s exactly what we did. We chose Norway since we have yet to try their sandwiches at Kringla Bakeri og Café. This is the best bargain in the world showcase, large delicious sandwiches and desserts for a great price and the shaded seating area wasn’t crowded at all. Kelli ordered a chocolate Kringla Sweet Pretzel and the Ham and Apple Sandwich- ham, apple, Jarisberg and muenster cheese with a sweet apple chutney on toasted bread. 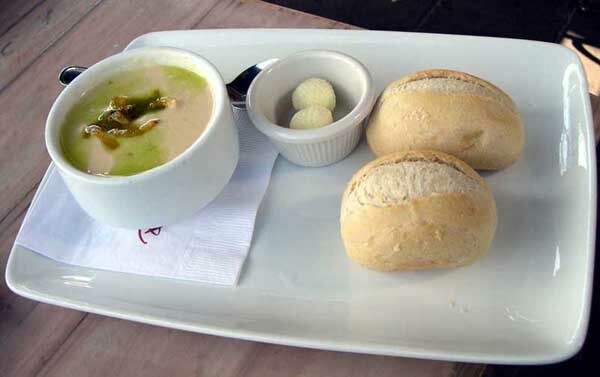 They were able to switch the bread to a ciabatta, as she was worried about what was in the whole grain it normally comes on. I had the Norwegian Club Sandwich - turkey, ham, bacon, Jarisberg and muenster cheese, with tomatoes, red onions and lingonberry mayonnaise on toasted multigrain bread; plus the School Bread. After lunch we hopped on the Maelstrom ride and we realized we haven’t been on this attraction for a while. One theme we had on this vacation was that on almost every attraction we had a minor stoppage on the ride. We stopped briefly where the boat turns and goes backwards. 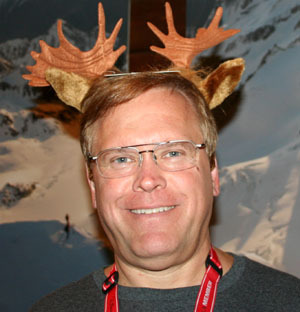 In the gift shop I tried on moose ears (not mouse ears) but decided not to buy. We headed back to the room but not before listening to the band in Mexico and some shopping in the showcase plaza and the Crown and Crest for some Guinness themed trinkets. 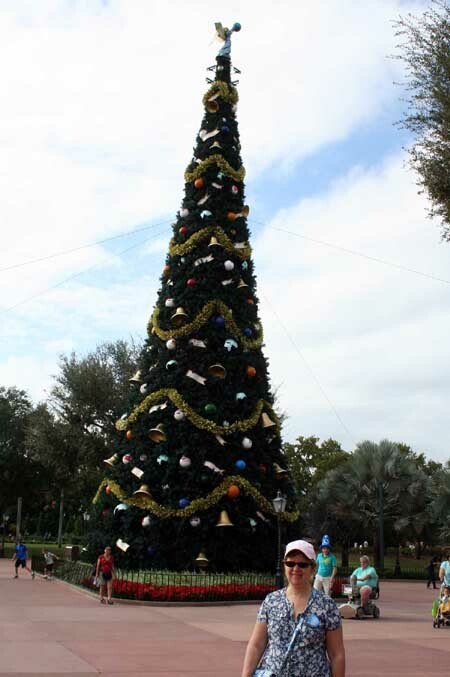 We also stopped and photographed the Christmas tree in the Showcase Plaza. 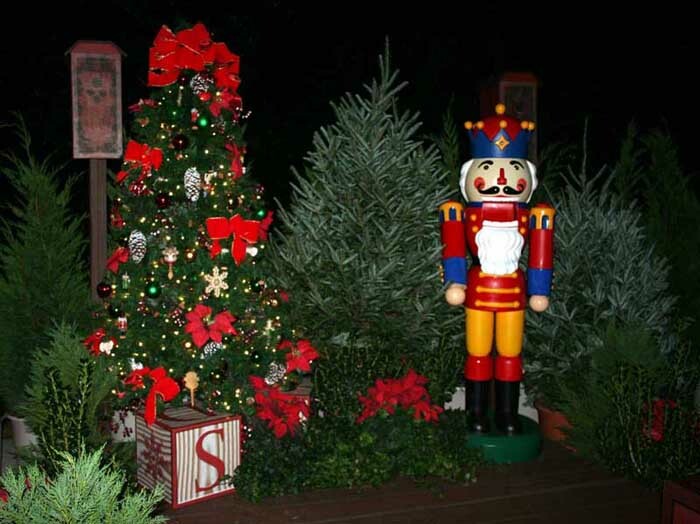 The tree was adorned with Merry Christmas or Happy Holidays signs in multiple languages. After relaxing on the balcony back at the room; we headed out just past three to the Magic Kingdom. 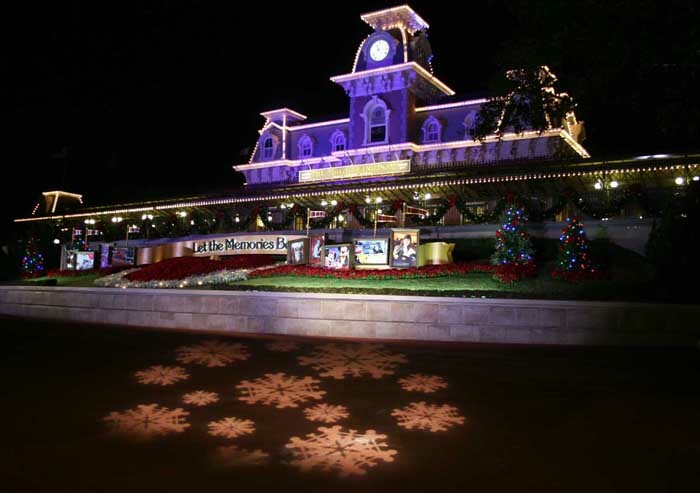 The park will close early at 7 pm for Mickey’s Very Merry Christmas Party. We had a bit of a wait for the bus, about 20 minutes. We were able to get our party bracelets as we entered. The park was decorated for Christmas so we first went up to the train station to get pictures of the square and Main Street. 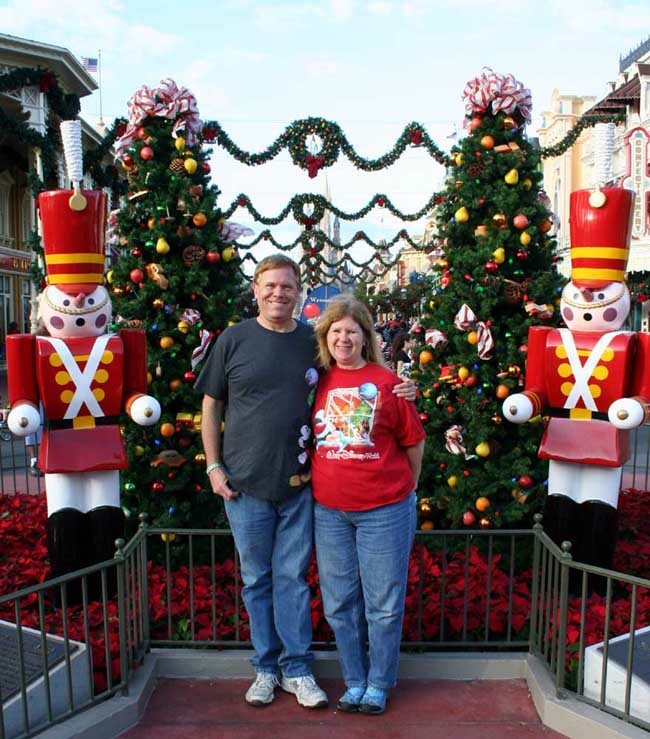 We had a photopass photographer take our picture at the flag pole then shopped on Main Street for the special Goofy Christmas vinylmation. 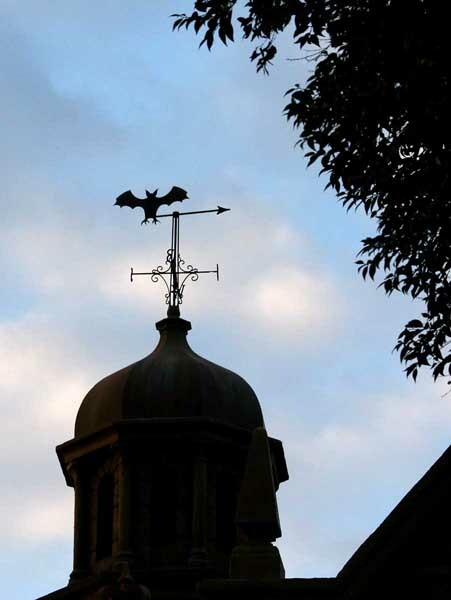 We then headed for the Haunted Mansion. 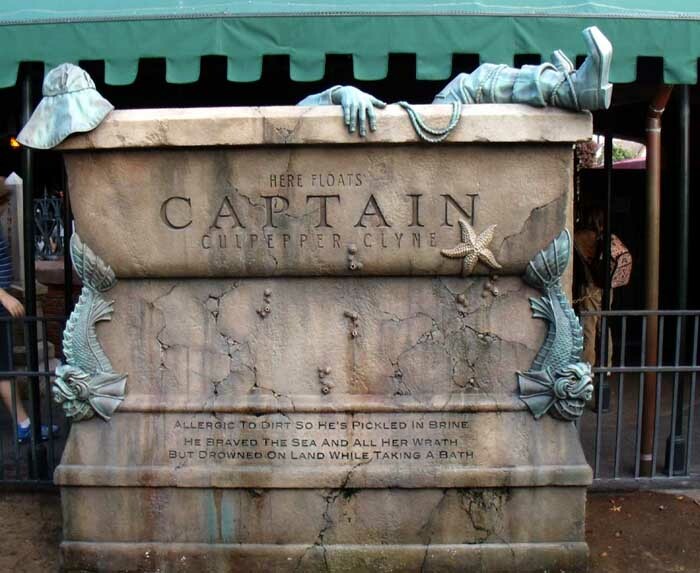 We explored the new queue with all the interactive headstones. I wasn’t paying attention at one point and the captain got me with a squirt of water. My favorite was where you had to complete the poetry, just before merging with the old queue. The ghost would recognize your voice if you had the right answers. The end of the ride with the hitch hiking ghosts were new to us as well. 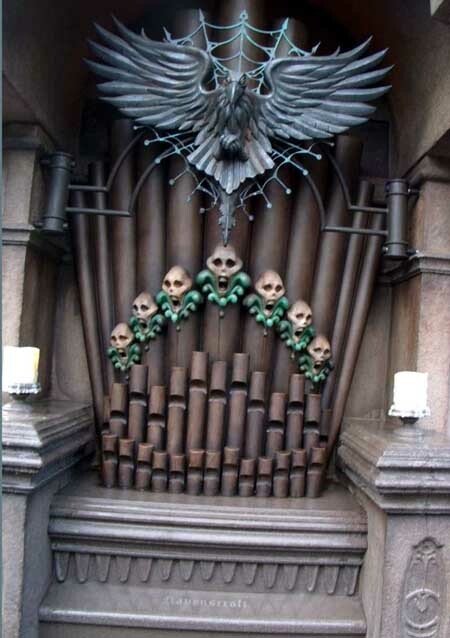 One of them blew our heads off – but it didn’t hurt. It was a bit weird watching our headless reflections for a few seconds. Outside we did the special photopass with the ghost carriage. 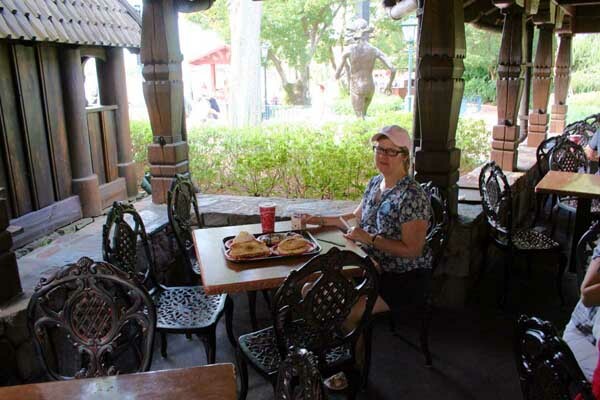 We tried to eat at Columbia Harbour House but it was closed, so we tried Pecos Bill-Tall Tale Inn. We had a BBQ pork sandwich and a taco salad. Kelli was impressed by the free fixin’s bar. The food was good but I’d like my taco meat much less salty. Next was the Enchanted Tiki Room, we just made the last show of the day and I was surprised they did the outside preshow. Gone is the "New Management" with Lago and Zazu and the show resembles the original version. I certainly don't miss Gilbert Gottfried voice! It was getting close to seven so we headed towards Tomorrowland. 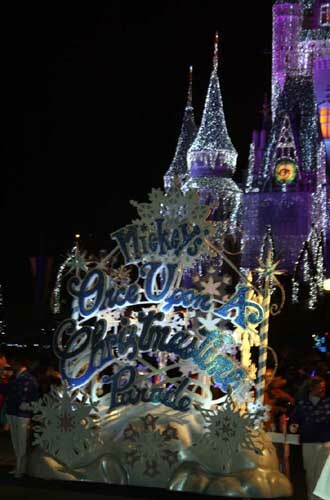 It was dark out now and then we saw Cinderella’s Castle in the ice lights and we could not take our eyes off it. After trying to get numerous pictures we continued on and enjoyed a ride on the People Mover, then shopped for some Christmas merchandise. We looked for the hot chocolate and cookies but they weren’t out yet. Cast members were checking for bracelets to make sure everyone bought tickets to the party. 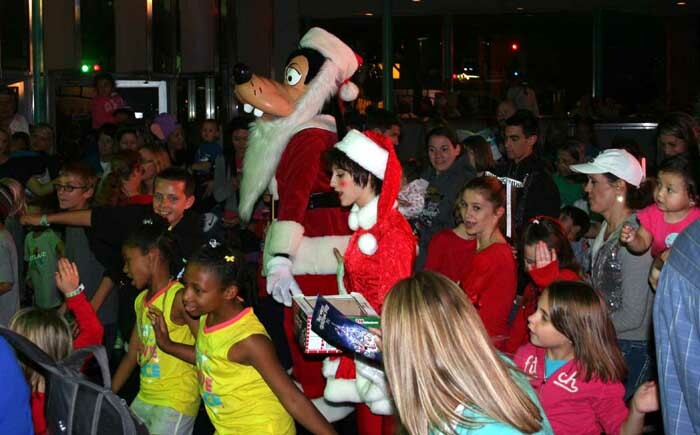 We saw Goofy in his Santa outfit and Pluto dancing with the crowd at Cosmic Ray’s Jingle Dance and Play and stayed for the music and people watching. 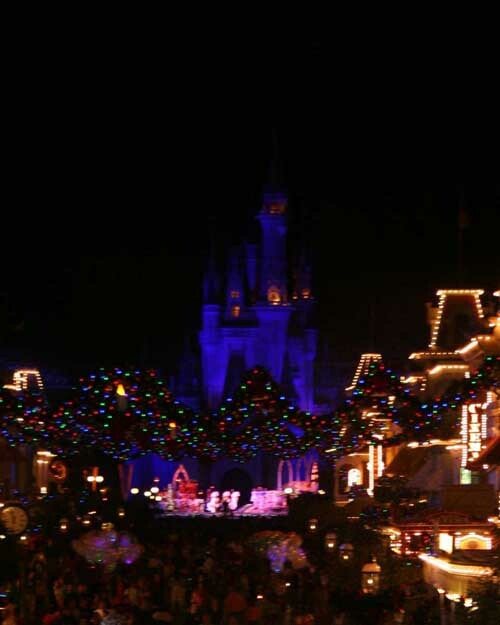 The Celebrate the Seasons stage show in front of the castle was about to start and after getting a photo of us with then castle from a Disney photographer, we positioned ourselves just at the edge of the hub. 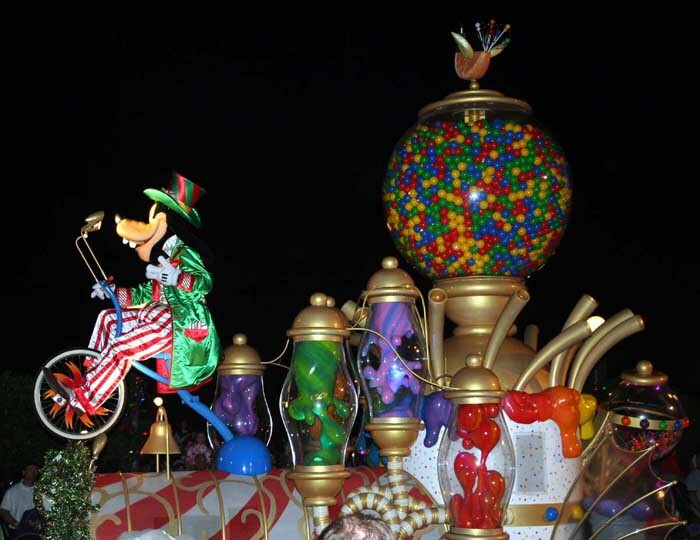 We really enjoyed the show then waited for Mickey’s Once Upon a Christmas parade. The parade highlight for us was the marching wooden soldiers. How they can see in the dark and perform marching maneuvers on the curve of the hub is beyond us. 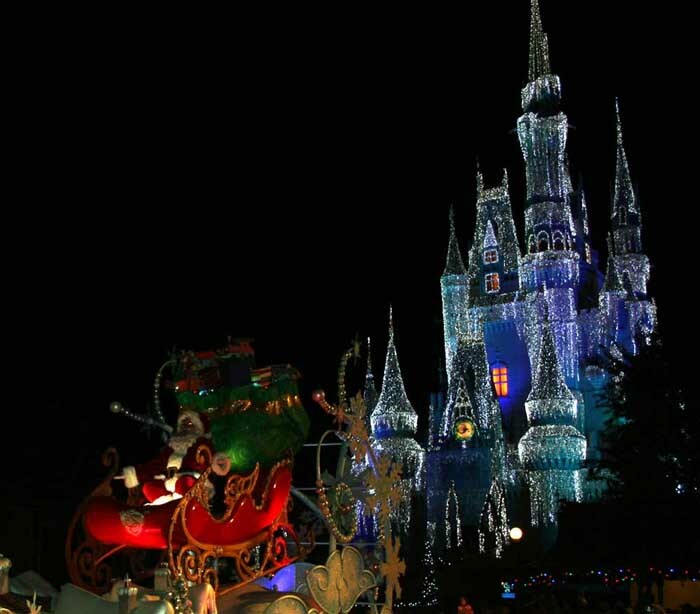 It was then a short wait for the castle projection show "The Magic, The Memories and You – Holiday Edition" and the new holiday part was fantastic. The castle turned into boxes of presents, which then unwrapped. 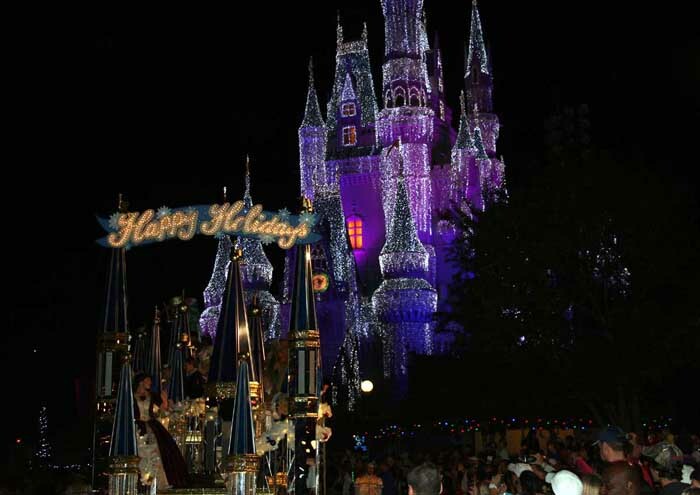 There was another short wait for the holiday version of Wishes. Great fireworks; and Tinkerbell flew very close over us – I liked our location. 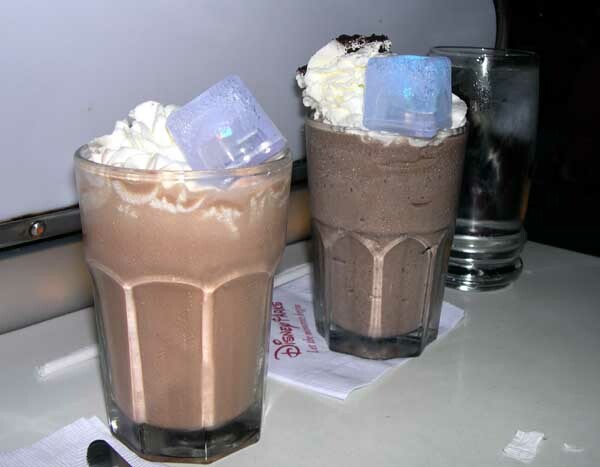 We then went to find the free hot chocolate and cookies and found them in Cosmic Rays. The hot chocolate was sweet and smooth - not watered down at all! The cookies were snicker doodles. 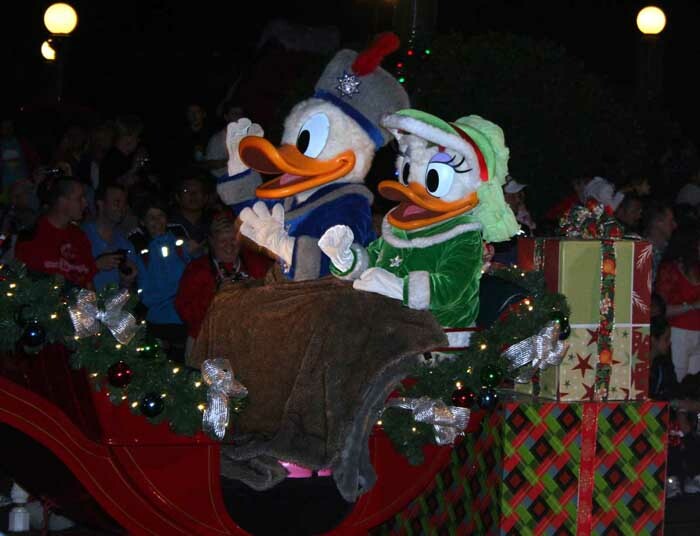 We sat down to enjoy them while watching Santa Goofy and Pluto dancing with the crowds. Buzz Lightyear Space Ranger Spin had a short wait so on we went. I scored better than Kelli (hint: shoot the targets on the robot's arm in the 1st room.) At the exit we saw Phineas & Ferb posing for pictures and hopped on the People Mover for second go around. We headed to the hub to catch most of the second parade. We wanted to see the marching wooden soldiers again. 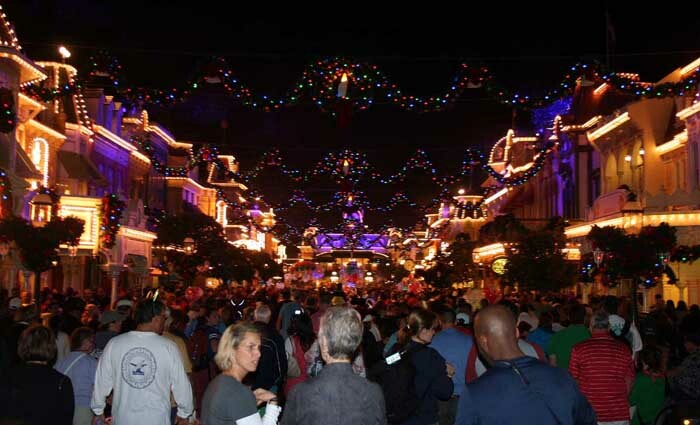 We let the parade crowd dissipate then shopped our way down Main Street. 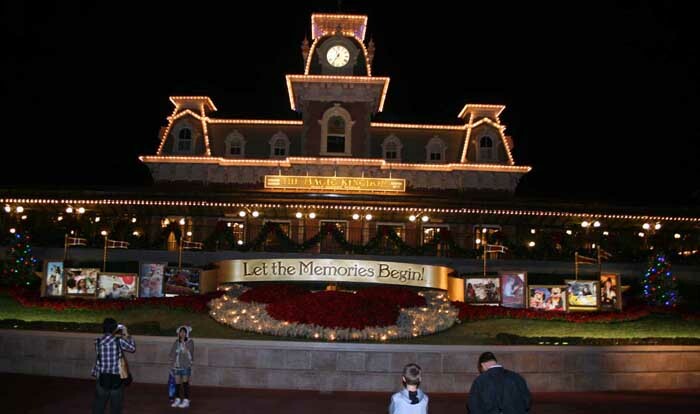 We went up to the train station to take more pictures, this time at night and then a few quick pictures in front of the Magic Kingdom, We left at 11:30 PM and after a moderate wait for the bus, and multiple stops at Epcot resorts we were back in the room and in bed half past twelve. 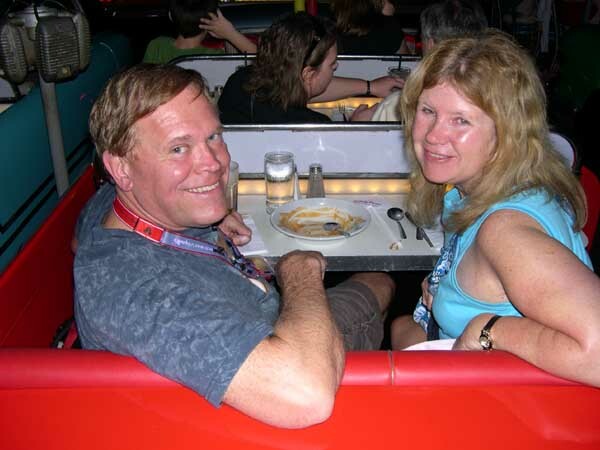 Another nice thing about our location and our accommodations was that I could get up early, get ready in the other room and let Kelli sleep so that I could spend the extra magic hour at Disney’s Hollywood Studios. Then come back and get her for the day. I had a quick breakfast of cereal in the villa, wore my Beaker (from the Muppets) T-shirt, and decided to walk to the studios. 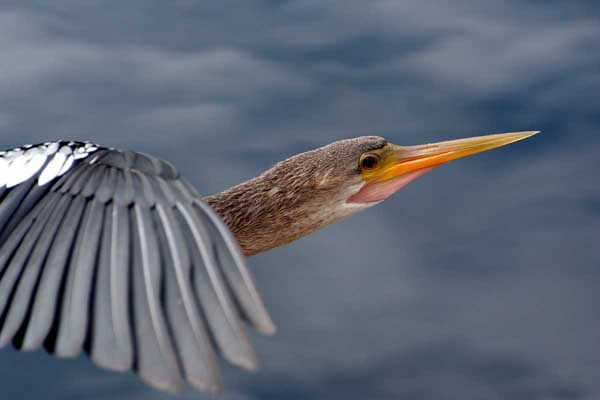 I would look for wildlife and other photographic opportunities along the way. I left the villa at 7:25 AM and got to the studios a couple of minutes after opening. If I didn’t stop for photos I’d say the walk would have taken me 25 minutes, not a short walk, but doable if your fit. I took the longer way around the lake past the Boardwalk Resort since the sun would be at my back for pictures. I used my panoramic setting on one of my cameras to get nice shots of the resorts. The empty boardwalk also made for some nice photos. 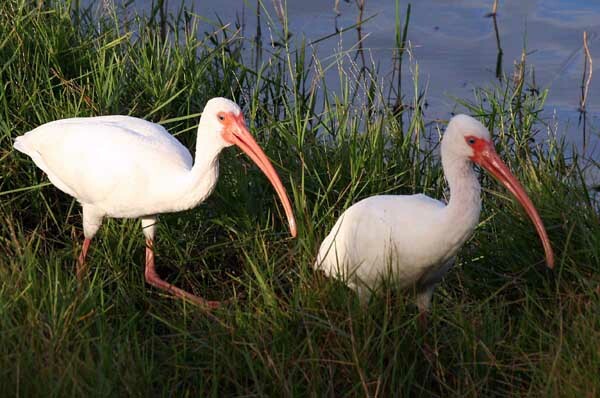 Once I was past the Boardwalk I saw more wildlife, mainly birds. There were small groups of American Coot in the water along with a Pied-billed Grebe or two. A few Mallard ducks were about along with the expected Great Egrets and White Ibis. 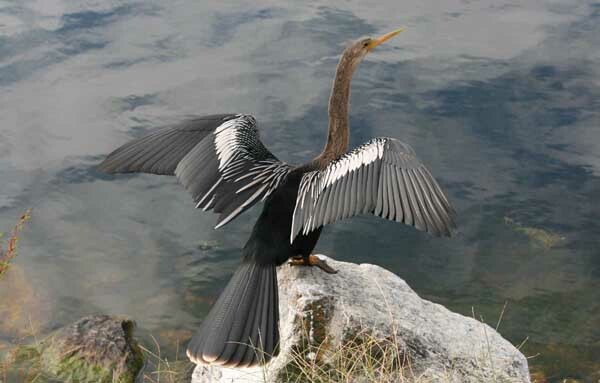 An Anhinga (sometimes called snake bird) was very obliging and I got some great close-ups of his very slim head. 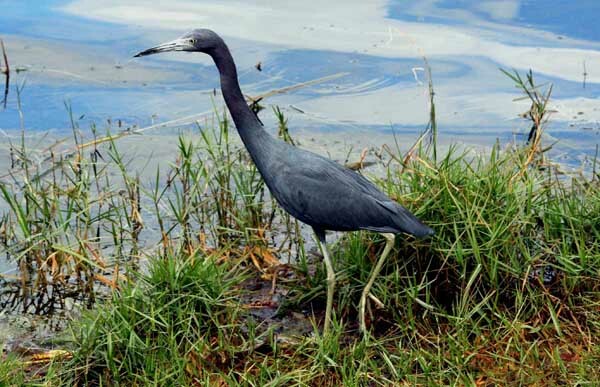 Another nice find was a Little Blue Heron. I quickly got through the turnstiles and although very tempted to head straight for Toy Story Mania I resisted. 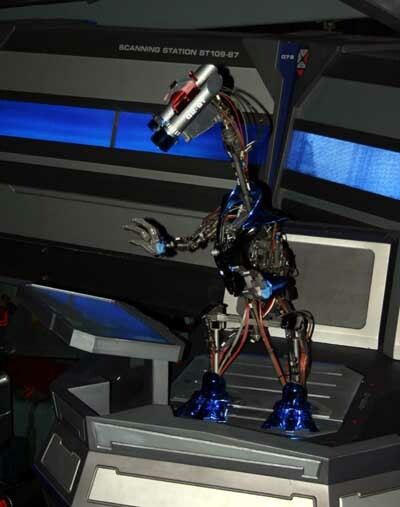 My mission today was to get as many rides on the new version of Star Tours. Kelli is not a big fan of motion rides and this was the only opportunity to not get in the way of touring the parks together. The queue for Star Tours was empty and I was able to stop and take my time photographing sites along the way. The robot x-raying luggage was funny. He would comment on what he was finding inside. 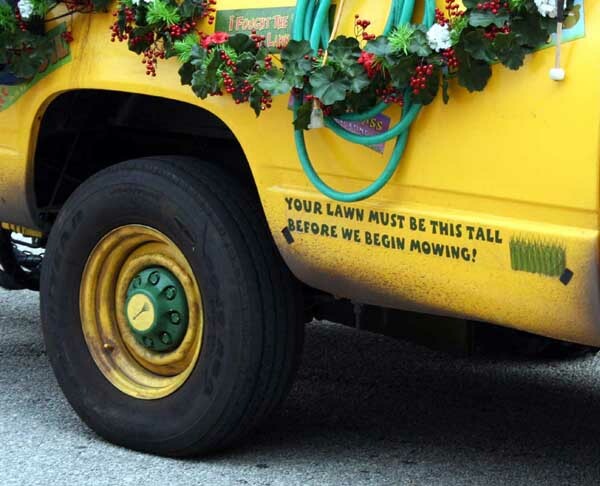 My first ride was in the front row – lots of legroom. The ride was fantastic. Darth Vader stopped our starspeeder looking for a rebel spy on board and I think we visited the ice planet Hoth and Coruscant. I could not wait to ride again to see more of the different scenes that are possible on the ride. I had my first of three compliments on my T-shirt when exiting the ride. Nice to know lots of people know who Beaker is. On the second ride I was in the middle and I was very pleased that every seat on the ride had great legroom. For tall people this makes it so much more comfortable to enjoy. What I didn’t notice on the first ride - since I was front row, was that a screen to the right showed other things going on, like R2D2 outside the shuttle. My surprise was when Darth Vader again stopped the shuttle looking for the rebel spy and up pops a picture of the spy on this smaller side screen – and it was me! I rode two more times, again visiting different worlds, including Tatooine, Kashyyyk, and participating in a pod race in Naboo. I also notice that when waiting in the loading area; watch the scenes as they prepare the shuttle for its journey. That can also be a little different each time! I think I saw each scene and hologram (Princess Leia, Yoda and General Ackbar) possible at least once in four trips. The experience put me in a great mood for the rest of the day – even Kelli noticed when I got back. On my fourth and final trip, it was past 9 AM and there was now a 10 minute wait to get into the boarding area, so I knew it was time to head back. 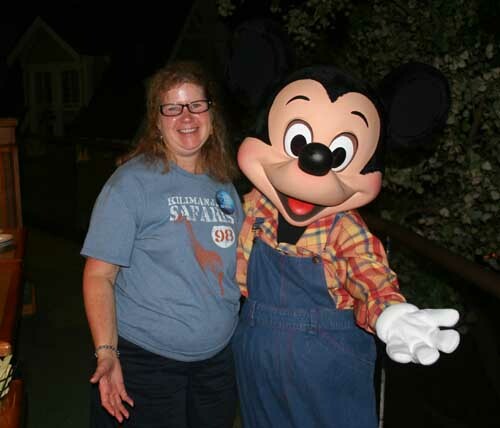 I called Kelli that I was on my way back, but stopped to make a vinylmation trade. I saw that I just missed the boat and decided to walk briskly back. 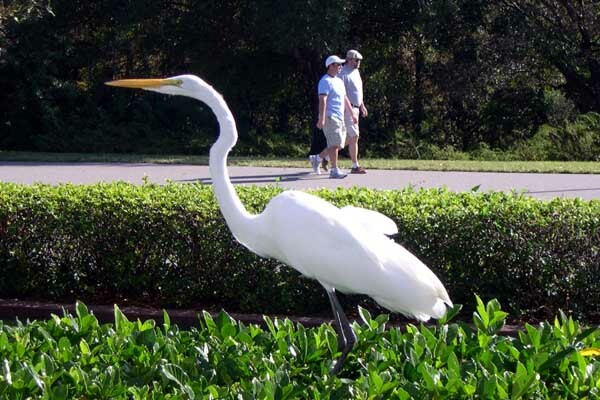 I barely bet the next boat back to near the Swan/Dolphin dock – so I could have saved the energy if I waited. 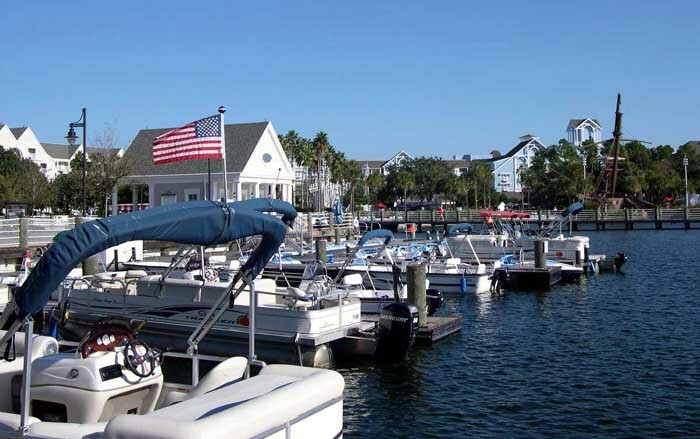 I did beat it back to the Yacht Club dock and with brisk walking made it back in 26 minutes. Kelli was enjoying the balcony so I started a wash in the villa and joined her out there for a little while. Both were out of this world! We both tried the BLT Soup - creamy tomato basil soup, topped with herb crouton, shredded lettuce and bacon and we both got All American Picnic Burger. One with the cucumber salad and the other french fries. Another unexpected surprise was the refreshing cucumber salad. It may not be for everyone but it’s so much better than french fries. The food was much better than expected, we’d definitely go back. 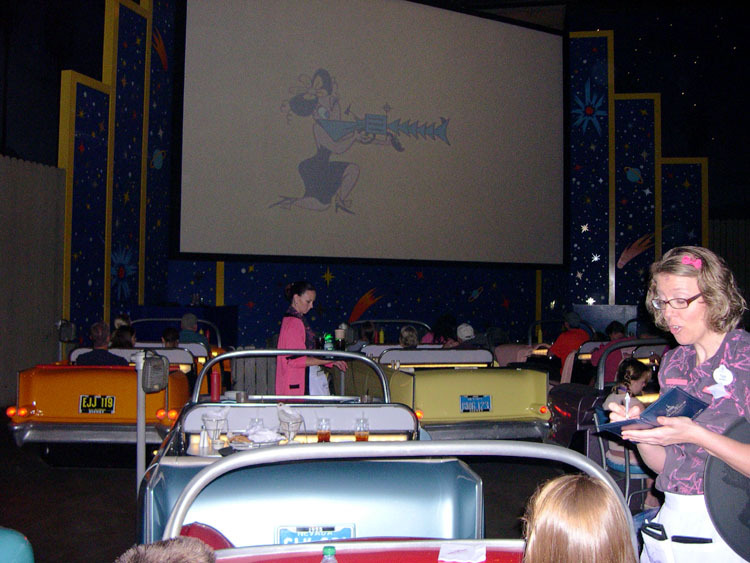 The restaurant is set up like a drive-in movie, the tables resemble old cars. A huge screen shows all these scenes from old B-type science fictions movies like "Attack of the 50ft Woman" and "Plan 9 from Outer Space." 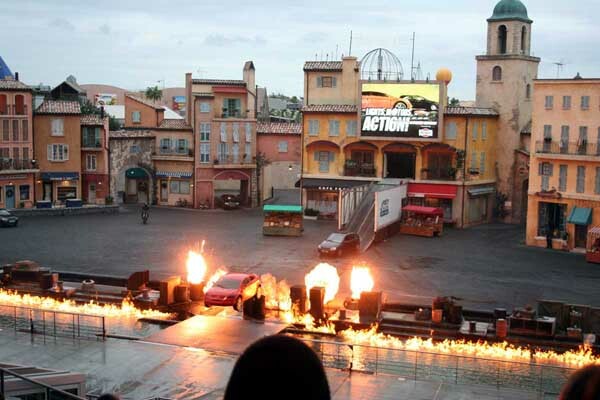 After lunch we tried to make it to the Lights, Motors, Action! Extreme Stunt Show but were a few minutes too late. 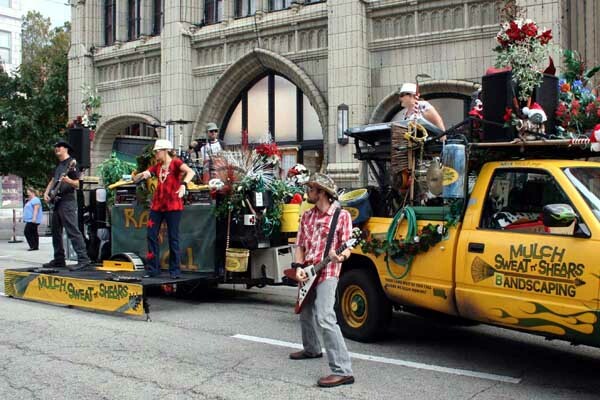 Instead we caught the Mulch Sweat n' Shears band show on the Streets of America. Now that’s my kind of music! – a lot more rock. I couldn’t believe this was the first time I saw them. The show was humorous and they ended with some rockin’ Christmas music. We made our way towards the Voyage of The Little Mermaid show, viewing the life size nativity scene on the way. We passed Toy Story Mania which went from a 70 to an 80 minute wait as we did. The rain scene in Mermaid was COLD! If feels great in the summer but wow in November! After that we headed to The Magic of Disney Animation, saw Mushu in the animation show and then waited a long time to get into the drawing class. We were one of the last ones in and had to sit up front without a table. 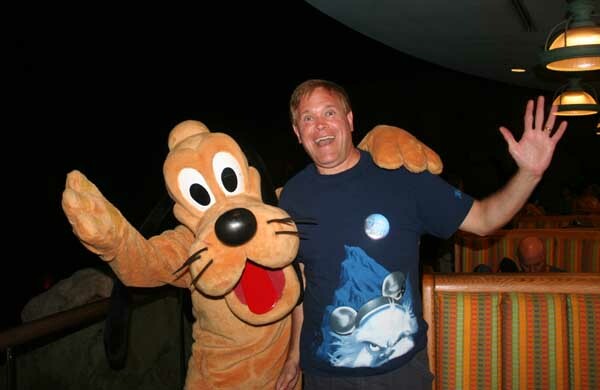 We got to draw Pluto! Much to our surprise the cast member teaching the class gave us hers! 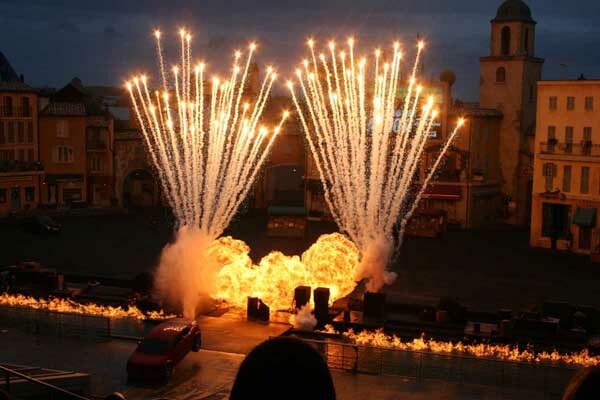 We made our way back to the car stunt show, brought a couple of churros and a soda, and headed in. I was very happy to finally see the show. Seems everyone I knew had seen it except me. I even got some great photos of the action. We waited for the crowd to dissipate, why wait in line getting out. 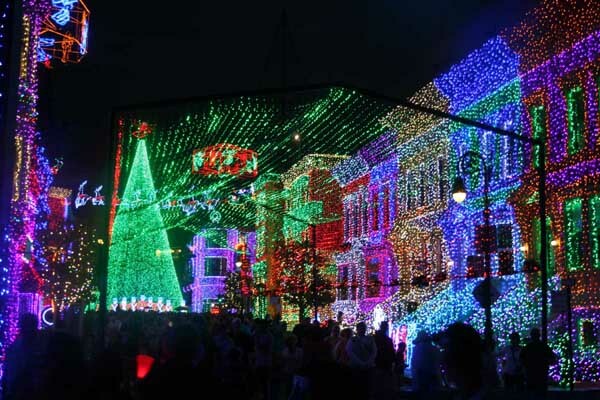 We had 30 minutes before night fall so we did Muppet Vision 3-D. Once we were out we headed to the Osborne Family Spectacle of Dancing Lights. We were both floored by the size and scope of the display. When the lights started to dance to the music we were even more in awe. 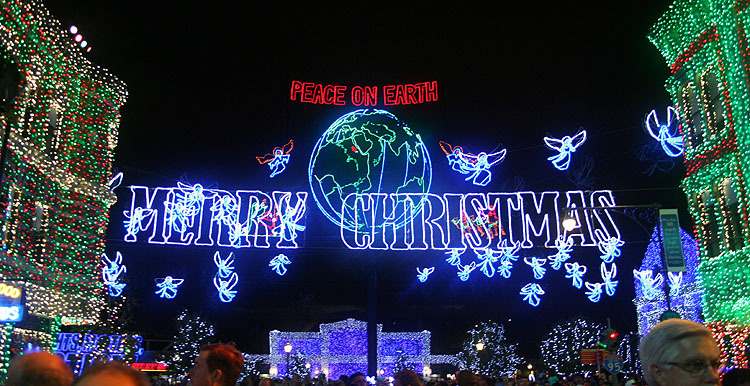 There are over 5 million lights! Another nice thing is that although crowded, there was room to walk around. We even got to see the lights dance to the Trans-Siberian Orchestra’ Christmas Eve/Sarajevo 12/24. On way out Kelli heard the song she walked down the aisle to - Christmas Canon, so we headed back to listen. We needed dinner but nothing in the studios appealed to us. We decided to head back by boat. When we passed the counter service at Stormalong bay - Hurricane Hanna's Grill we decided to check it out. We both wanted the grilled chicken salad (mixed greens, dried cranberries, white cheddar cheese, croutons and white balsamic dressing) but they only had one left. So we also got the Turkey Sandwich (smoked turkey served on a sourdough baguette, basil mayonnaise and fresh mozzarella cheese with cabbage slaw). We went up to the room and split each entrée. This was another surprise – both the salad and sandwich were great, very fresh and tasty. Who would have thought you’d get a nice meal at a poolside counter service. 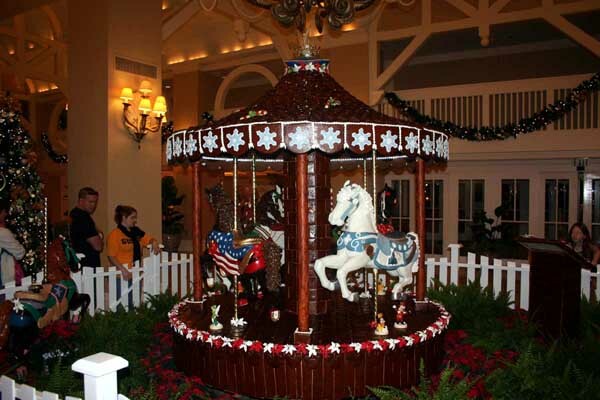 We went out later to view the finished gingerbread carousel in the Beach Club lobby and share a dessert at Beaches and Cream. We didn’t want to get stuffed and the 2-scoop hot fudge sundae was just the right size to share. We again slept in but were out of the villa by 9. It’s nice not to be rushing to get ready everyday on a vacation. We wanted a laid back day so decided to check out the monorail resorts. We headed to Epcot and since it’s only a 5 minute walk away we were there just after opening. We headed straight for Soarin’, grabbed fast passes and rode. Living with the Land had a short wait so we rode that. There were a few different things fruiting since we rode last spring. We stopped at the Art of Disney on the way out to the monorail. We were temped to by a few of the more expensive items but decided not to. It is still a nice store to explore and look through. 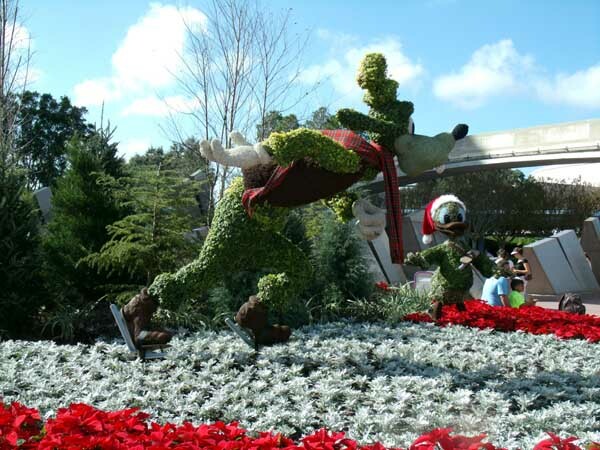 There were holiday topiaries in front of Spaceship Earth which featured Donald and Goofy skating. We had a short wait for the monorail. Since we wanted the resort monorail next at the ticket and transportation center; we had to walk down the long ramp, cross under the rails and back up another ramp to get to it. When we got the Polynesian Resort we decided to get off and check out the gift shop that’s just inside from the monorail. We did buy a few items and then we were back on our way. 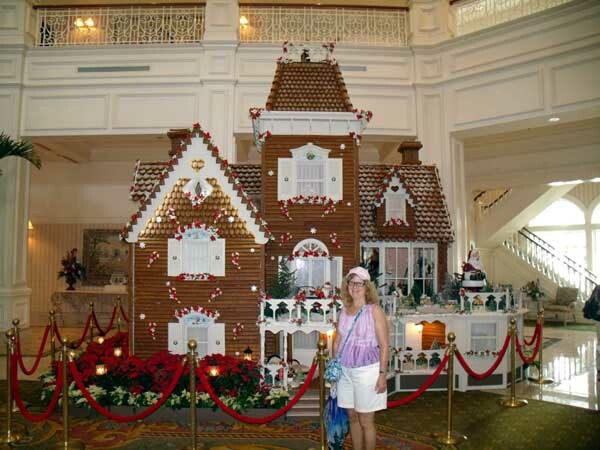 The Grand Floridian lobby was decorated and we could see the gingerbread house from the upper level. We stopped in the White Basin shop first. This place is good to know incase you can’t get to Downtown Disney for the regular basin shop. We wanted some bath items for the whirlpool back at the villa and some specialty soaps for gifts. We also got a nice discount here by being DVC members. We headed downstairs to get a better look at the huge gingerbread house and the lobby Christmas tree. We noticed that some sort of tea party was in progress nearby – but I thought that only took place in the afternoon. We also looked through some of the finer shops downstairs, and then checked out Mickey Mouse Mercantile on the second floor before getting back on the monorail. 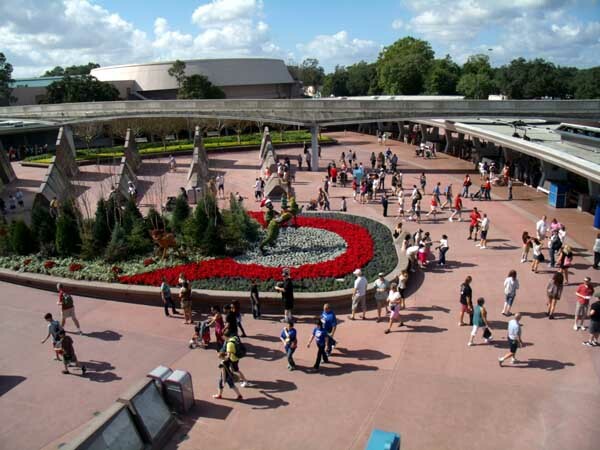 Again – since we were on the resort monorail loop we had to exit the station down the ramp at Ticket and Transportation and back up the ramps to get to the Epcot monorail. 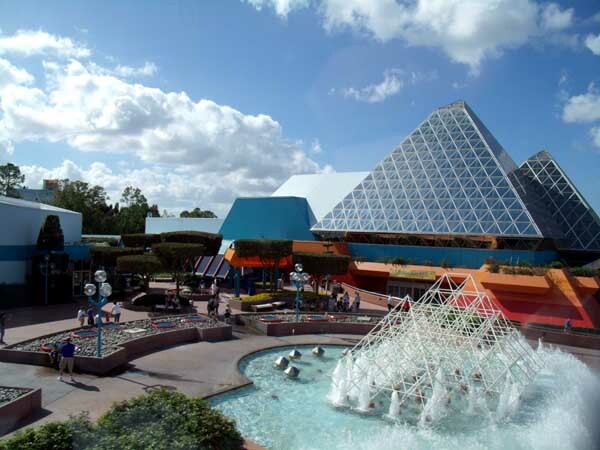 I took some nice photos of Epcot from the monorail as we looped around Spaceship Earth before being dropped at the station. We headed to the Disney Visa Rewards meet 'n' greet photo opportunity in Innovations but it hadn’t opened yet. Instead we headed to Mouse Gears and brought a lot of stuff. Nothing like getting some early Christmas shopping done while on vacation! Kelli let me choose lunch and I picked La Cantina de San Angel counter service in Mexico. I had the tacos de pollo plus churros with milk caramel and she tried the kid’s meal cheese empanada. It was a long wait for the food, so Kelli grabbed a table and I found her after it finally came. The food was good, but nothing special with the exception of the milk caramel sauce for the churro – yum! We headed back to the room, dropped off our packages and headed for Stormalong Bay pool. Most of the beach chairs were occupied or “claimed” and we almost left but I found two chairs up on top of the pavilion and had to carry two of them to the other side for some sun. We relaxed for a couple of hours and I think we each nodded off. The sun eventually went in and we needed to get ready for dinner. After freshening up we headed over to Epcot for our 6 PM ADR at the Garden Grill. The Garden Grill’s Chip N’ Dale Harvest Feast featured Mahi Mahi topped with sweet tomato and fennel chutney for the sustainable fish of the day. I normally don’t like mahi mahi - but this was great! The beef was really good and the turkey was OK (a little too salty for me). The cranberry orange relish was unique and tasty. The salad before hand was very fresh and crisp. The dessert was wonderful as well, a bake harvest fruit crisp with vanilla ice-cream. 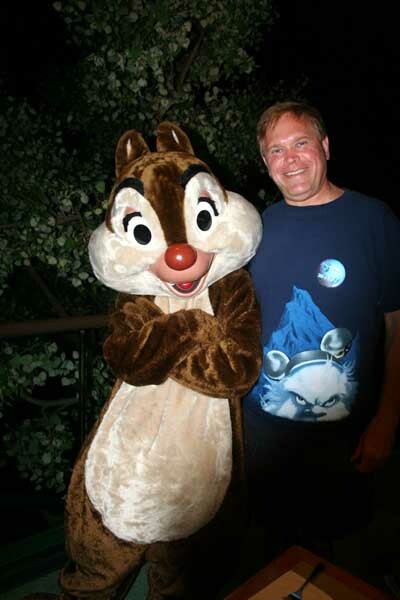 All the characters, Mickey, Pluto, Chip and Dale came to the table at least once, and then we just waved high to them on the next go around. With the Tables in Wonderland Card the bill with tip came out to $80.48, a savings of $16.61. This time they didn’t tax the tip as I have seen some Disney restaurant do in the past. After dinner we did Soarin’ with our fast passes. This time we were on the far upper right and we could see these distracting lines in the film or screen. 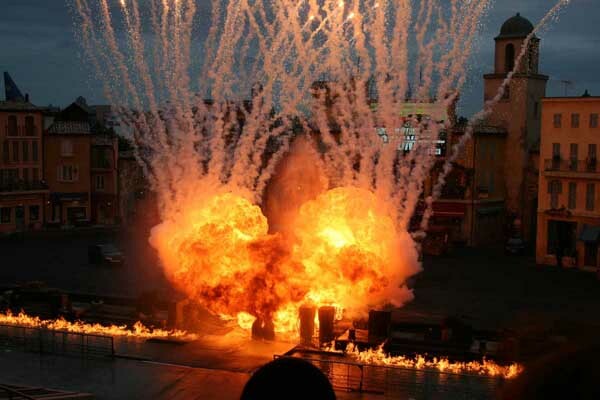 This might be caused by the seats so far right, if not, Soarin’ is badly in need of refurbishment. We headed over to ride the Seas with Nemo & Friends then caught the last showing of Turtle Talk with Crush. Crush seemed to interact longer with the audience this timw. We tried to get on Journey Into Imagination with Figment, but it had already closed for the day. We headed down to the showcase lagoon and waited to see IllumiNations again; standing between the World Showcase Plaza and Canada to finish the evening. We walked back to the room to finish packing; but I detoured to the lobby to ask some questions about DME and checking luggage. It was a good thing I did. We spent way more than planned on gifts and souvenirs. Fortunately we packed our free Aulani bag we got for signing up with DVC at the last minute. I used my small carryon luggage as our second checked bag and used the Aulani bag as my carryon - worked out great. I will pack my swim trunks in the day pack to use later tomorrow since our carry-ons will be held by the hotel. We made breakfast one last time, cooking the remainder of the bacon and eggs and ate again on the balcony. 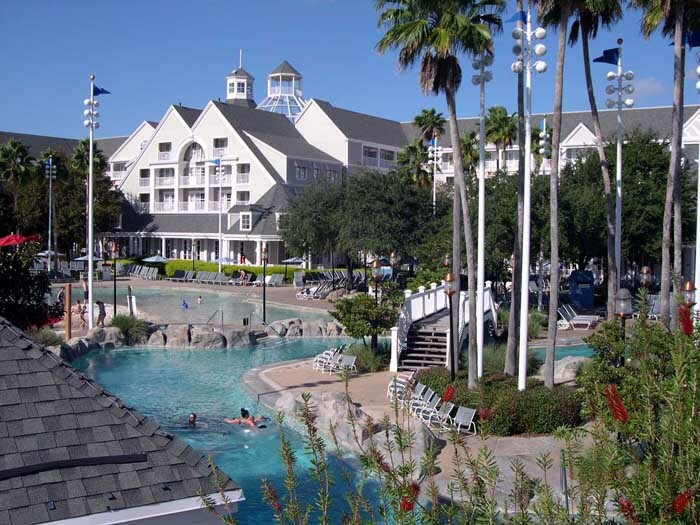 I think having a balcony is one of Kelli’s favorite perks about being a DVC member. We took our two bags to be check into JetBlue at the kiosk just outside the lobby. The TSA agents were the friendliest and helpful agents we’ve ever encountered. (How did Disney get these guys?). They even ask us if we were sure that anything we needed for the day wasn’t in the luggage. They checked us in and gave us our boarding passes. Wow, now later we just have to go through security and get to the gate. We went back to the room, freshened up one last time and put the final items into our carry-ons. We checked them into the hotel to hold till our DME bus time (3:50 PM). We then took the bus to the Animal Kingdom. There wasn’t a lot we wanted to do here, our main objective was seeing the Festival of the Lion King. It’s Tough to be a Bug said it had a short wait, so we decided to do that first. Unfortunately we had moronic people who block the queue waiting for others in their group so we missed the next show. By the time we waited under the Tree of Life we knew we didn’t have enough time to spare to get to the Lion King. When the doors opened to the theater we had to cross the room and head right back out the exit doors. We made it easily to the Lion King and sat in the giraffe section. The show was great as usual. 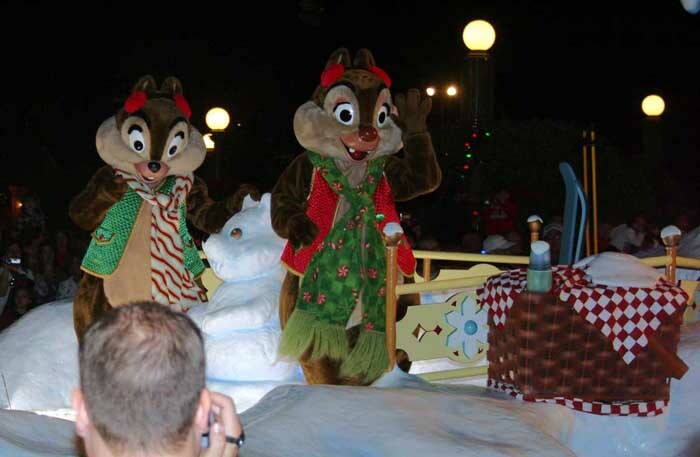 We really like how the cast members took the kids who were in wheelchairs and made sure they were part of the show. We needed the restrooms so headed over to the side entrance to Pizzafari – avoiding the exiting Lion King crowd that doesn’t know about this restroom spot. It’s not on the map. Lunch was at Flame Tree Barbeque; we split a chicken and ribs combo and had key lime and chocolate mousse for dessert. We sat way down by the water for a relaxing meal. After some quick shopping we headed back to the Beach Club Villas. 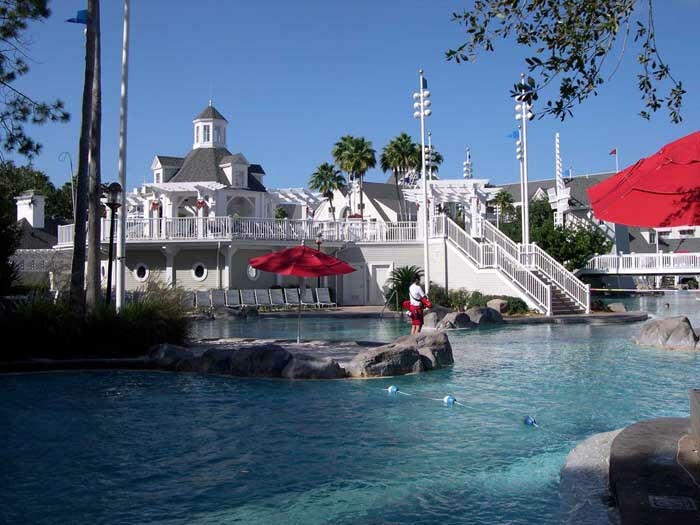 We headed straight for the quiet DVC pool. I used the restrooms at the pool to change. We tried to get some sun and relax. It was warmer than expected. Kelli wished she had brought a swim suit top to change into, but was ok lounging at the pool in shorts and a T. It clouded over and then a light rain started. Our only real rain of the trip! We moved under an umbrella with a table and the rain picked up. The umbrella was filling with water and leaking, so we had to dash for the building. After drying off a bit we decided to get our carry-ons and change into jeans early for the trip back to the cold northeast. We used the lobby restrooms to change. We waited in the lobby, then outside for the DME bus. 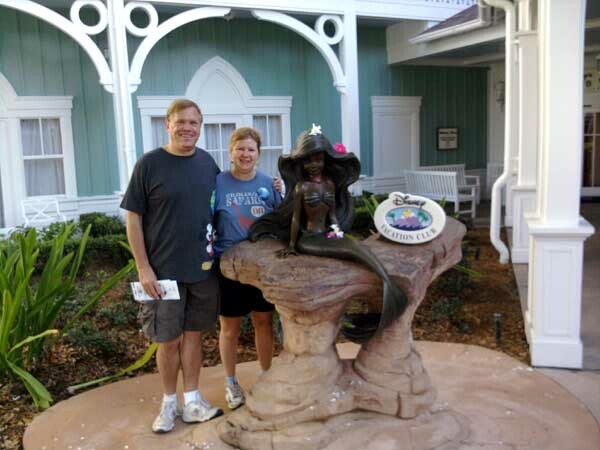 We made a number of stops including a long one at the Caribbean Beach resort, but we had so much time before our flight we didn’t care. At the airport we grabbed some last minute office gifts at the Disney store and lucked out finding an exact replacement to Kelli’s Disney watch. We had fried it when it accidentally went into the drier back at the resort. Security was easy to get through and we ate in the JetBlue terminal. To pass the time I also had some Cold Stone Creamery ice-cream. Our flight home was bumpy; we met our luggage at the carousel and our nephew was waiting to give us a ride home. 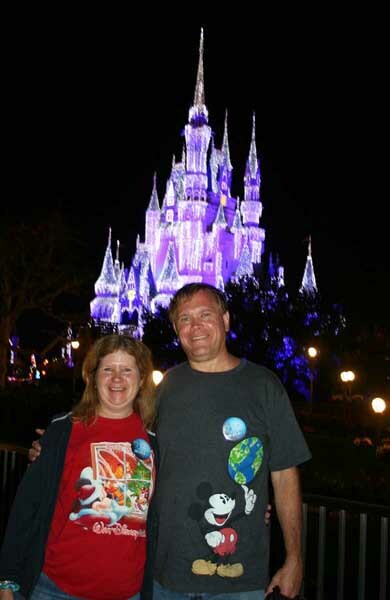 We are very glad we are now Disney Vacation Club members, the added cost for us is worth it. 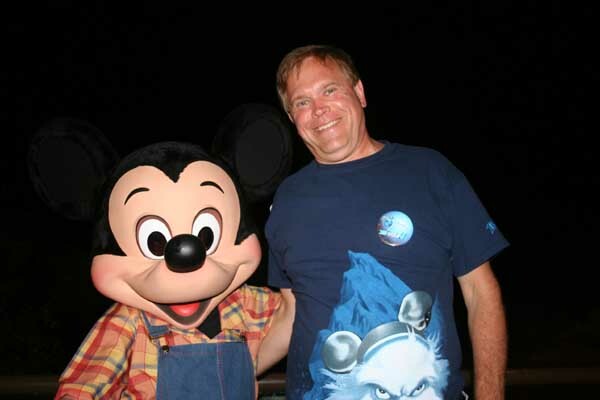 The free Disney Magical Express bus service was way better than we imagined. It is the way to go if you are trying to save money not renting a car or just want the nearly hassle free journey through the airports. 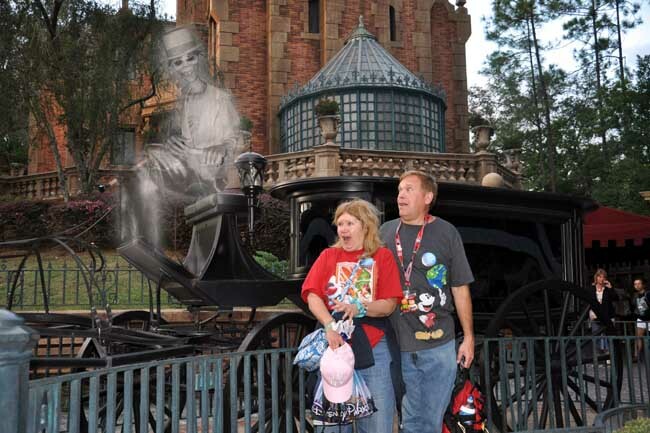 Special photopass with the ghost carriage.